Political-philosophical documentary "What is Democracy?" will screen at the Brattle Theatre in Cambridge Feb. 1-7. “It’s a good metaphor, I think, for our problems today — the social body being sawed apart,” Taylor says in the film. The documentary, titled “What is democracy?” capitalizes on imagery, as Taylor travels to modern democracies fragmented by political discord. In one moment, the audience sits in on a close-up interview with Trump-supporting college students in Raleigh, North Carolina. In the next, they see African-American philosopher Cornel West, who argues that acts in favor of democratic racial equality such as school desegregation were achieved through somewhat undemocratic methods. Taylor was raised in an unconventional household where she and her siblings were all “unschooled,” a practice that critiques the conventional system of education by pursuing one’s interest at home. Taylor briefly attended the University of Georgia and then Brown University before quitting college for good. She then started to practice “unschooling” as an ethos of “lifelong commitment” to curiosity. Her upbringing and devotion to curiosity inspired her to document the meaning of democracy. She began in 2011, observing global protests such as the Occupy Wall Street movement, the Arab Spring and the movement of the squares in Europe. “What is Democracy?” stitches together interviews with a diverse cast of subjects who represent different social justice viewpoints. Although transitions between average citizens, academic interviews and B-roll can sometimes come across as disjointed, the documentary nonetheless represents its subjects in an earnest manner. Featured citizens include African American public school students, a disenfranchised ex-prisoner, surgeons, Latin American immigrants and Middle Eastern refugees. In taking a more transparent approach to documenting its subject matters, “What is Democracy?” transcends an abstract debate among scholars and college classrooms and translates it to common language rooted in universal ideals such as justice, hope and equality. The interviewees in the documentary are not plot devices or living case studies — they are representatives of democracy as the world knows it. In a memorable scene, African American students in a Miami public school engage in a roundtable discussion on the state of the American education system. When asked if their learning environment provides them “a seat at the table, ” they respond that their school teaches them democracy but ultimately refuses to practice it in classrooms. Though she critiques the American education system, Taylor hopes to take the documentary on a university tour. Her reason? To start a discussion. 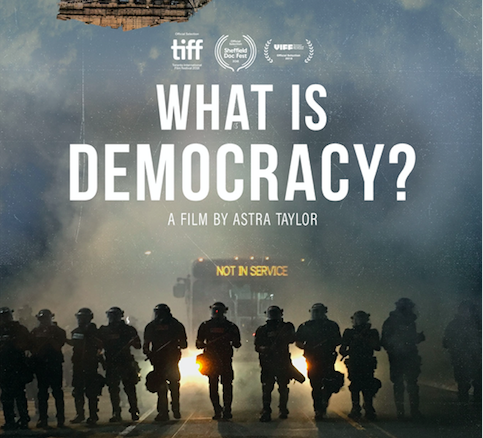 “What is Democracy?” will screen at the Brattle Theatre in Cambridge Feb. 1-7, at $9.50 for students.